Friday February 1, 2019-Bungoma Senator, Moses Wetangula, has said National Super Alliance (NASA) leader, Raila Odinga, is a liar who should be not believed by any politician in the country. 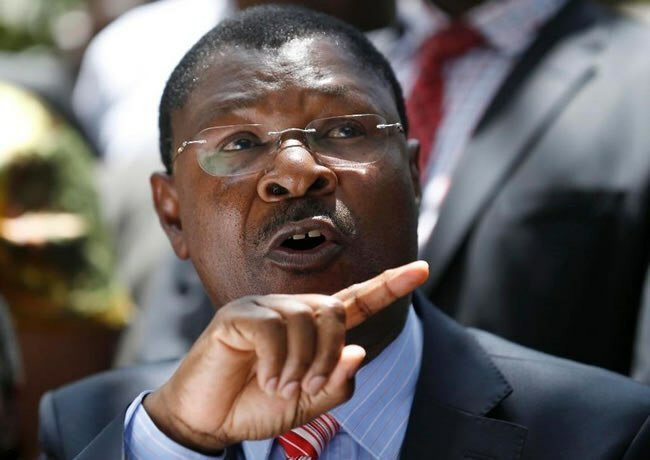 In an interview with Radio Jambo on Friday morning, Wetangula who is also the Ford Kenya party leader, narrated how Raila lied to him, Wiper Party leader Kalonzo Musyoka and Amani National Congress (ANC) leader Musalia Mudavadi hours to the oath which Raila took early last year. “We as lawyers knew the legal consequences of holding a swearing-in ceremony illegally, we tried to convince our party leader but he could not listen to us”, Wetangula said. According to Wetangula, Raila told them to wait for him in a house in Karen estate and gave them a Nigerian phone number which they were to reach him with. “Raila told us to wait for him so as he would come and give us the way forward: however, time was elapsing and he was not coming so we decided to reach him using the Nigerian phone number in vain”, he said. The senator said that together with Mudavadi and Kalonzo, they were shocked to see Raila entering Uhuru Park on national television since they were supposed to meet at the house then proceed together to Uhuru Park. “We were not in the know and my brother Raila betrayed us: besides, that was an unlawful oath: that is all I can say and I do not want to talk much about it since that is now irrelevant, let us focus on other important matters”, he noted. Wetangula also confirmed that NASA is dead since Raila Odinga joined other “meat eating hyenas” in Jubilee.